The Palestinian Prisoners’ Society (PPS) has reported that Israeli soldiers abducted, on Monday at dawn, at least ten Palestinians from their homes, in several parts of the occupied West Bank, after the army invaded and violently searched many homes. The PPS office in Bethlehem said the soldiers invaded Beit Fajjar town, south of Bethlehem, and abducted Malek Eyad Thawabta and Mohammad Khalil Thawabta. It is worth mentioning that Beit Fajjar has been subject to constant Israeli military invasions, and violent searches of homes in addition to frequent abductions of youngsters. In addition, the soldiers invaded the al-Qubeiba village, northwest of occupied Jerusalem, searched homes and abducted Nidal Mustafa Makhtoub. Several army jeeps also invaded Sateh Marhaba area in the al-Biereh city, in central West Bank. In Hebron, in the southern part of the occupied West Bank, the soldiers invaded Halhoul town, north of the city, and abducted Noureddin Mahmoud Zama’ra, after searching his home. 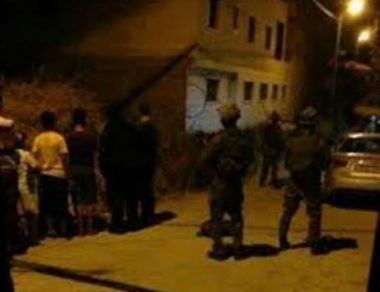 The soldiers also invaded homes in Beit Kahil town, northwest of Hebron, and abducted Abdul-Mahdi Zohour and Mohammad Ali Asafra. It is worth mentioning that the soldiers also invaded and violently searched homes, owned by members of Natsha and Dweik families in Hebron city, and summoned Nour Shaker al-Atrash for interrogation. Furthermore, the soldiers invaded Kafr Saba neighborhood, west of the northern West Bank city of Qalqilia, and abducted Ahmad Qassem Daoud, 18, from his home, after invading and searching it. The soldiers also invaded and ransacked several homes in Azzoun town, east of Qalqilia, and interrogated many Palestinians. In Jenin, in northern West Bank, the soldiers abducted a former political prisoner, identified as Nazeeh Sa’id Abu ‘Oun, 62, and his son, Islam, from their homes in Jaba’ town, south of the city. The soldiers also invaded and searched several other homes in the town, and interrogated many Palestinians. The soldiers also abducted a former political prisoner, identified as Mhanna Khaled Sharqawi, from his home in Zababda town, south of the city, after storming and ransacking his property.